The simplest way to include a charitable contribution in your estate is through your will. The amount you give won't reduce your income taxes, but it could reduce your taxable estate, potentially increasing the amount you'll be able to leave to your heirs. Donating a retirement account is another straightforward and tax-effective way to support a charity. You simply designate the charity as the beneficiary on your account. Because the charity is exempt from both income and estate taxes, it can receive 100% of the account's value. You can then leave non-retirement assets, which don't have the same income tax burden, to your children. If you'd like to donate assets to a charity but retain some of the benefits of holding those assets, a gift of split interest might be a good option. With split-interest gifts, the donor opens and funds a trust in the charity's name and receives a charitable income tax deduction at the time of the transfer. Opening a trust allows the donor to retain some rights to the property and also reduces the value of his or her taxable estate. In addition, the donor may be able to avoid capital gains on the assets transferred to the trust. This may sound like it's only for the ultra-wealthy, but it doesn't have to be. For example, I know a couple who have been affiliated with a university for most of their lives. They met there as undergraduate students and continued their graduate studies there, as well. Despite having fairly modest assets, this couple wanted to return something to their alma mater. After careful consideration, they decided to transfer a portion of their assets into a trust that would provide them with income during their retirement years but that would ultimately pass on to the university. Charitable remainder trust (CRT): A CRT provides either a fixed payment or a fixed percentage to the donor (or other beneficiary) every year. In either case, the amount must be at least 5% but no more than 50% of the property's fair market value. The trust is irrevocable and must make payouts at least annually. The term can be for the life of the donor or for a set number of years. At the end of the term, the remainder goes to the designated charity. If your primary goal in setting up a CRT is to maximize the payments during your lifetime, consider whether the trust assets have the potential to appreciate. If they do, you're better off receiving a percentage of the trust's value every year. If you believe the assets will decline in value, you're better off receiving a fixed payment. Charitable lead trust (CLT): A CLT is the reverse of a CRT. It provides income to a charity for a set number of years, after which the remainder passes to the donor's heirs. It can be a good choice if you don't need lifetime income from a particular asset. The trust is often structured to get an income tax deduction equal to the fair market value of the property transferred, with the remaining interest valued at zero to eliminate a taxable gift. Like a CRT, a CLT is irrevocable. 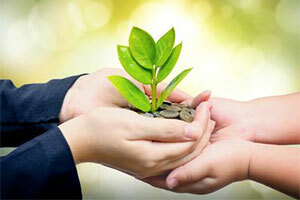 Pooled income fund (PIF): A PIF is a trust maintained by a public charity. Individual donors contribute to the fund, which works like a CRT with the charity acting as the administrator. As with a CRT, the donor receives income during his or her lifetime. After the donor passes away, control of the funds goes to the charity. Contributions to a PIF qualify for charitable income, gift and estate tax deductions. A PIF doesn't require the legal expense of creating an individual trust. While including a charity in your estate plan is commendable, it's wise to share your intent with your kids ahead of time so they understand your reasoning. I always recommend openly discussing your estate plan with your family so there are no surprises when inheritances are distributed. In the case of giving to charity, you're not only talking about money, you're talking about creating a legacy. This may be something your kids will not only admire, but also want to carry on. One of the best-kept secrets for making the most of your giving—both during your life and as part of your estate—is a donor-advised fund. You can open this type of account with a tax-deductible contribution and then make grants to any public charity over time. You can contribute a variety of tax-deductible assets, including appreciated securities, real estate and cash. While many people think of a donor-advised fund as a tax-smart way to give during their lifetime, they may not realize that it can also support estate and legacy planning. You can make the account the beneficiary of a will, retirement account, and/or trust to help reduce your taxable estate while continuing your giving beyond your lifetime. Plus, it's easy. The fund sponsor, such as Schwab Charitable™, handles all the administrative details. You can even get your kids involved by naming them as successors on your account. Content Courtesy Schwab.com, used with permission.